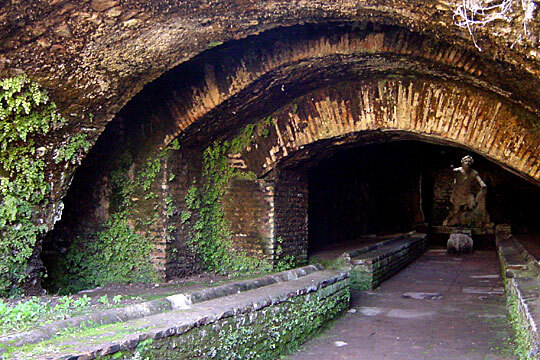 Mitreo delle terme di Mitra – Mithraeum. Our Common Sun. A Mithraeum (Reg. I, Is. XVII, 2) built in the foundations of the therms of Trajan (�Termi di Mitra�). The sanctuary (L. 15.37 Br. 4.55) has been constructed in the northernmost part of a corridor, which was separated from the other underground rooms. Only a small communication entrance was left open in the l. wall (Br. 0.80). The main entrance (Br. 0.75) is on the western side and is accessible by a long flight of steps which takes its beginning in the uperlying corridor of the therms. The whole Mithraeum is vaulted and has a large arch at a distance of 6.55 mtrs from the main entrance. This divides the sanctuary in two parts. The vault has in the sanctuary proper two rectangular funnels. From the fresco-decoration only some traces of green bushes have been preserved. Two benches (H. 0.33) along the side-walls; they are accessible by small steps under the separating-arch; the benches do not run as far as the back-wall but they leave an open space in which a large base for the cult image. At the ends of the benches there are two columns (H. 0.55) on which two rough coniform stones (H. 0.20) where found. Between the ends of the podia in the central aisle there are two bases, one rectangular (H. 0.50 Br. 0.42) one triangular (H. 0.35 Br. 0.50). Dating: 1st half of the III century A.D.